We are proud to announce you that the Lebanese Association for Development - Al Majmoua, our microfinance institution (MFi) partner in Lebanon, has successfully completed all requirements for becoming the first MIX Socially Transparent And Responsible (S.T.A.R.) MFI in the MENA region. Yesterday, MIX congratulated the Lebanese Association for Development - Al Majmoua for its commitment to being socially transparent and responsible. They recognized Al Majmoua for completing MIX’s social performance desk review process and successfully meeting all 2013 S.T.A.R. requirements. What are MIX S.T.A.R. MFIs? MIX S.T.A.R. (Socially Transparent And Responsible) MFIs are recognized as such for having achieved a high level of compliance with the Social Performance Task Force’s (SPTF’s) Universal Standards of Social Performance Management (USSPM). To receive this recognition, MFIs must report on and provide appropriate documentation for each area of the SPTF's USSPM that is also covered by MIX's social performance (SP) indicators, as well as having documented environmental protection policies in place. To finance projects of micro-entrepreneurs in Lebanon with Al Majmoua: click here. 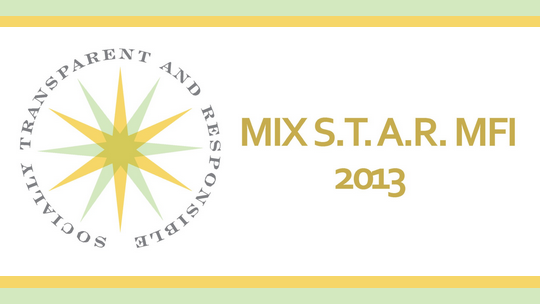 To know more about the MIX S.T.A.R. requirements, click here.